The CorneliOS Web OS is an easy-to-use, multi-user and cross-browser "Web Desktop Environment", "Web Operating System" or "Web Office". Gnome Photo Frame is a photo frame gadget for the GNOME Desktop. It shows pictures from local folders, F-Spot-Database, Flickr, RSS, Picasa, and more. Histwi is linux desktop program for Twitter account management. It features downloading and saving of tweets, (un)follow any friends, multiple accounts, etc. 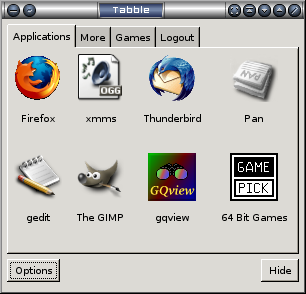 tabble is a small alternative X shell which presents your programs in tabs for easy launch. It is not meant to replace a window manager, just complement it. Java Virtual Keyboard lets you easily "type" letters which are not on your keyboard using your mouse. It's realized in Java and thus runs on Linux and other platforms. JShot is a free and multiplatform screen capture and uploader utility which allows you to capture a part of your screen and publish it in one step. Typhon is a slim and themeable OpenGL-based dashboard and program launcher. It’s meant to be easily used on Linux HTPCs. Recoll is a personal full text search tool for Unix/Linux. It searches most common document types, emails and their attachments. Recoll uses a Qt-based GUI. FB-Mix is a simple mixer applet for the system tray. It is designed to sit in the Fluxbox system tray and popup an alsamixer window when clicked. Font Manager is a font management application for the GNOME desktop. It is a simple software application suitable for the needs of most desktop users. neap is a neat Linux pager unintrusive and light (cpu / aestetic) that runs in the notification area (i.e. systray) of your panel. neap follows freedesktop specifications. key-mon (Keyboard Status Monitor) is a Linux utility that shows live keyboard and mouse status for teaching and screencasts.